We accommodate our cows in an ergonomic and comfortable growing environment. 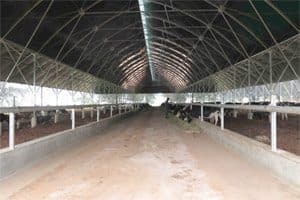 The cowshed functions as a closed and safe environment for the cows, giving protection from rain and sufficient shade. The structure is highly ventilated and made out of galvanized steel covered with shaded polyethylene. 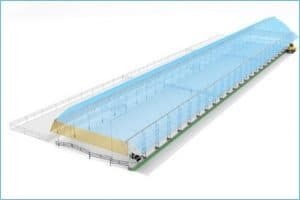 The feeding is done inside the greenhouse which is located close to the milking parlor, allowing a short walking distance for the cows. It is important for us to get the most out of all the elements involved in our system, therefore we utilize the organic waste created by the cows to fertilize the fields and create bio gas for green energy. 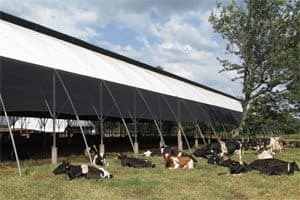 In addition, we supply and install optional systems to improve living conditions for the cows, thus making them healthier and more productive. Some of the optional systems are: circulation fans, fogger systems, massage pits. Our shed is a modular construction and can fit in any place, according to your needs.